Visco-Gel® Little ToeBuddy® toe spacers gently separate and align your two smallest toes for maximum comfort. 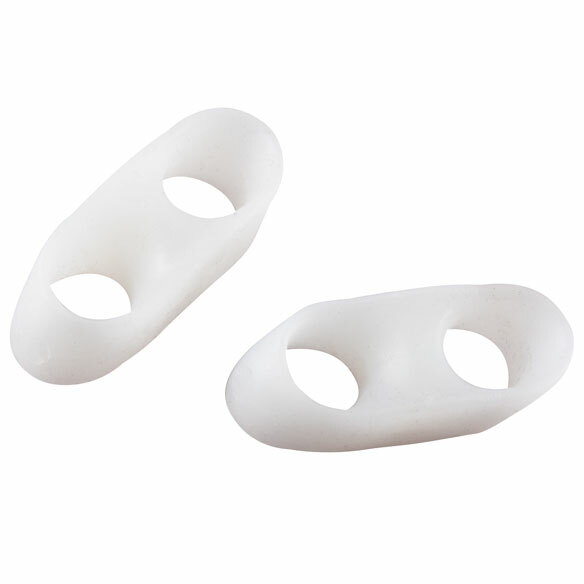 Soft, pliable silicone gel toe spacers helps relieve painful irritation caused by friction and overlap. Discreet and comfortable toe separator with or without shoes. Set of 2 washable, reusable loops. Hand wash in warm, soapy water; air dry. I have bought this product before. It worked wonderfully then, I expect a similar result now. I did not rate it (the first purchase), because I wasn't sure it would work. Now I'm sure! Yes, it works! Shoes that had just enough pinch to be uncomfortable can now be worn all day with nary a thought. Thanks Easy Comforts! I have quite a few foot problems and these help a lot. Previous surgery caused my toe to flop out to the side. Just looking for some comfort. Looks like it might work without being too bulky. My little toe seems to tuck under my foot. So these little toes can be more comfortable!! To keep my toes from rubbing. This product works, see my review. Painful little toe on my right foot. This product will keep my toe straight and protect it from rubbing in my shoes and forming a callous. Because the middle toe on my foot (third toe from Big Toe #1), has been twisting sideways, trying (and attempting) to get under her neighbor toe, #2. It's noticeable wearing sandals, so I thought I'd try this out. I have a little toe that lies in the other toe and i believe it will be just the thing for it. I've used it in the past and find they help to keep corns from forming between the toes. Because they separate my toes and my small toe does not hurt in my shoe now. to help small toe from hurting. new to me, will try for comfort with corn. They are the best I have ever had!!! Curling toes are starting to overlap. Arthritic 4th toe underlaps 3rd toe. Trying to find something to ease the pain in my small toe as it pushes against the 4th toe and gets sore. My little toe lies under the next toe, hoping this helps to straighten both toes. It's the only product I found for the pinky toe. Having problem with my toes.